It is necessary when buying and using your outdoor rugs to bear the following points in mind. Fit is all-important. Rugs are usually sized in three-inch increments. The measurement refers to the centre of the chest of the horse along the body to the rear of the quarters where you expect the rug to finish. As horses of any given size vary so much in girth and build, it is essential to take these measurements before purchasing your rug. A rug will not stay in place unless it fits properly. A badly fitted rug will slip and be strained to breaking point. Horses come in a variety of shapes and sizes. If a horse is exceptionally broad in the back it may be necessary to buy the next size up in relation to its height. Alternatively, it may be necessary to look at several different styles. It is essential that a rug should fit well on the withers and shoulders so that the horse can move freely underneath the fabric without the rug slipping back. If this happens the rug is put under strain and can cause sore areas. Once you have ascertained that the rug fits well around the neck, pull the rug into position along the horse's back so that the coat lies flat. 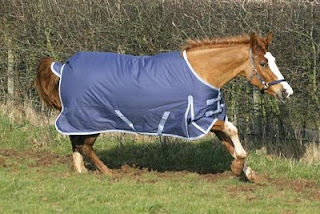 With rugs using leg straps, take the left leg strap, pass between the hind legs and fasten it on the left-hand side. Take the right leg strap. pass it between the hind legs and through the loop made by the first strap and fasten to the right hand side. Adjust the leg straps equally until there is room for the width of one hand (4-5") between the leg straps and the horse's thigh. This is to allow freedom of movement. The leg straps are linked to prevent rubbing and act with each other to pull the rug into place. 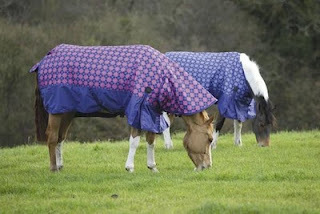 When the horse is grazing, the leg straps should be close to its thighs to keep the rug in position. If the rug is fitted as described it will have very little through movement and rolling. If the leg straps are too loose, the rug will slip. When fitting a rug with cross surcingles, care should be taken to ensure the straps of the cross surcingle cross in the centre of the horse's belly well forward of the horse's stifle. i.e. so that the crossed straps are on the roundest part of his body. Again there should be a hand's breadth between the straps and the horse.